Side Effects of Invokana | Invokana Kidney Failure called Ketoacidosis. March 21, 2016 — San Diego, CA. Approved for use in the United States merely three years ago, the Type II diabetes drug Invokana is now carrying warnings from the U.S. Food and Drug Administration (FDA) for possible life-threatening side effects. 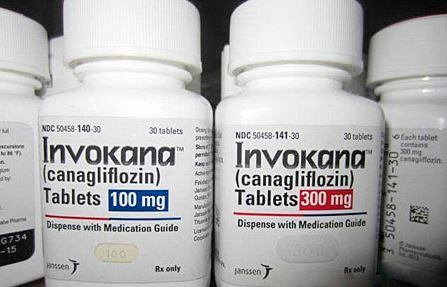 Canagliflozin, manufactured by the Johnson & Johnson subsidiary Janssen Pharmaceuticals and marketed as Invokana, was the first in a new class of drugs approved by the FDA on March 29, 2013. Canagliflozin, Invokana’s main ingredient, is part of a group of drugs called sodium-glucose co-transporter 2 (SGLT2) inhibitors. These drugs are used to treat people with Type II diabetes and work by blocking the re-absorption of glucose (blood sugar) in the kidney. About a year and a half after its introduction to the market, the FDA found that people taking Invokana were reporting serious, life-threatening side effects. One of those side effects included a complication usually seen in Type I diabetics: diabetic ketoacidosis. Diabetic ketoacidosis occurs when the body breaks down fat as fuel instead of sugar, causing a buildup of ketones in the body. It can be life-threatening if not treated. Between the time Invokana was approved in March 2013 and May 2015, the FDA investigated 73 cases of ketoacidosis in patients with either Type I or Type II diabetes being treated with SGLT2 inhibitors like Invokana. All of the patients required hospitalization or treatment in emergency rooms. In many cases, doctors did not diagnose patients with ketoacidosis right away because blood sugar levels were lower than what is normally expected. The FDA warns anyone with symptoms of ketoacidosis to stop taking their SGLT2 inhibitor drug and seek medical attention immediately. Another possible side effect of Invokana was serious urinary tract infections (UTIs). These infections were serious enough to land some patients in intensive care units due to kidney failure. Between March 2013 and October 2014, the FDA investigated 19 cases of life-threatening blood and kidney infections in patients taking SGLT2 inhibitors. Each of the infections had started as urinary tract infections. Of the 19 cases, four people were admitted into intensive care units and two required dialysis to treat kidney failure. On May 15, 2015, the FDA issued a warning to consumers about the possible risk of developing diabetic ketoacidosis when taking Invokana and other SGLT2 inhibitors. About seven months later, on Dec. 4, 2015, the FDA updated that warning to include the possible risk of serious urinary tract infections that could require hospitalization. Janssen was required to change its label to warn consumers of these possible risks. The warning applies to all SGLT2 inhibitor medicines, including Invokana, Invokamet, Farxiga, Xidguo XR, Jardiance, Glyxambi and Synjardy. There were about 29.1 million Americans with Type II diabetes in 2012, according to the American Diabetes Association. About 10 to 40 percent of Type II diabetics are expected to suffer from kidney failure, says the National Kidney Foundation. Medications like Invokana were intended to help patients manage their Type II diabetes but they may be causing side effects that could lead to kidney failure if not treated. The Hood National Law Group is currently investigating possible kidney failure injury from the drug Invokana. Our attorney and lawyers hold companies like Janssen responsible for the harm they have been inflicting on consumers for decades. If you or a loved one has been harmed by Invokana, contact the Hood National Law Group today for a free case evaluation. Simply fill out the form on the right-hand side of the screen or call 1-800-214-1010.